"We were able to show that by engineering how polymer chains bond to each other in a blended film, we could increase the thermal conductivity by an order of magnitude," explains UM engineer Kevin Pipe, whose expertise is in microscale heat transfer. For the project, Pipe collaborated with UM materials scientist Jinsang Kim, whose work focuses on molecular design and synthesis. In recent years, two main approaches have been taken to increase the thermal conductivities of polymers, which are normally in the range of 0.1-0.5 W m-1K -1, Pipe says. Some researchers have focused on blending polymers with fillers (metallic or ceramic particles) that have high thermal conductivity. 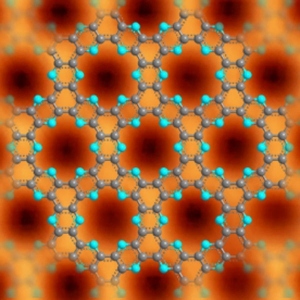 Though this technique has resulted in thermal conductivities of 1-10 W m-1K -1, it has a few drawbacks, such as increased cost and weight of the polymer and altered electrical and optical properties. The second method involves aligning polymer chains. 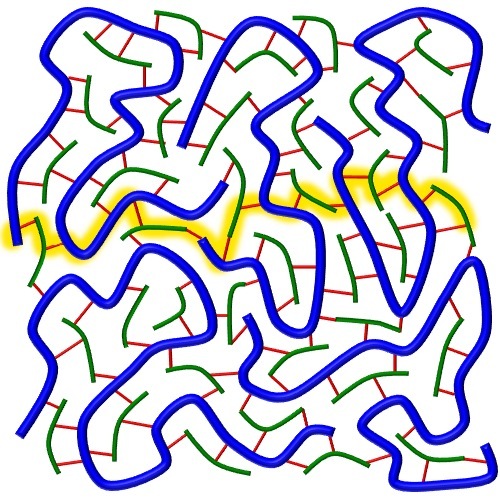 But with this technique, high thermal conductivity is limited to the direction of chain orientation and the approach requires nonconventional fabrication techniques, such as electrospinning, nanoscale templating, or mechanical stretching. "Those are the main two methods," Pipe says. Until now, "not many people have looked at how to do molecular design for heat transfer in polymers." Heat is carried through solids by vibrations. 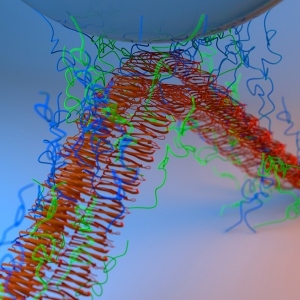 For these vibrations to carry heat efficiently through a polymer, the material's long, spaghetti-like chains need to be bonded strongly together. If they're bound loosely (which is usually the case), one polymer chain will not adequately vibrate (and propagate heat) in response to the vibration of a nearby chain. What's more, uniformly high heat conductivity in bulk polymers requires a high density of these strong bonds to be distributed homogenously throughout the material. To achieve these features, Pipe, Kim, and their colleagues sought to find polymer blends that form hydrogen bonds, which are 10 to 100 times stronger than the van der Waals forces that normally bind polymer chains. For the H-bond-accepting polymer, they focused on polyacryloyl piperidine (PAP). And for the H-bond-donating polymer, they tested polyacrylic acid (PAA), polyvinyl alcohol (PVA), and polyvinyl phenol (PVPh). The researchers made their blends through a standard, spin-casting fabrication method. In short, they made solutions of their two chosen polymers by dissolving them in dimethylformamide, and then mixed them together at defined molar ratios. They then spin-cast the material onto a silicon substrate, producing thin polymer-blend films. They found that certain blends of PAP:PAA had the highest conductivity value as measured by the differential 3ω method (which measures the temperature rise across a film), containing an exceptionally homogenous, high-density distribution of strong H-bonds. 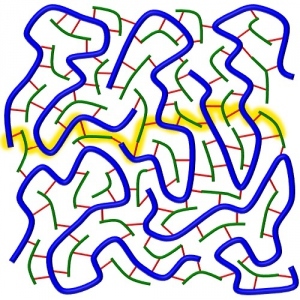 "The PAP:PAA bond is strong and formed very close to the backbones of the two polymers, with no large linker groups in the way," unlike with the other polymer blends, Pipe says. Getting the correct blend ratio is key because "there is a certain mixture fraction where we maximize the number of hydrogen bonds in the system," he adds. This creates a three-dimensional network of strong bonds that facilitates heat flow in all directions. For the PAP:PAA blend, a PAP concentration of about 0.3 yielded the highest thermal conductivity of over 1.5 W m-1K-1. Gang Chen of the Massachusetts Institute of Technology is impressed with the work. "I believe there is lots of room in engineering thermal conductivity of polymers and this is an excellent step forward," says Chen, who has previously researched improving heat conductivity in polymers by aligning molecular chains. Baratunde Cola, a materials scientist at the Georgia Institute of Technology, says, "A method to produce bulk polymer with isotropically high thermal conductivity-achieved without a conductive filler material-has the potential to revolutionize how we dissipate heat reliably in electronic devices, and many other technological systems." Cola says that the new study is a "very important step towards realizing such breakthrough materials." Xiaojia Wang, a materials scientist at the University of Minnesota, says that using stronger chemical linkers and a more homogenous distribution of these linkers could improve the heat conductivity of the blends, although achieving this will be challenging. "However, it opens the possibilities of synthesizing polymers that are isotropic thermal conductors and can be processed via conventional manufacturing methods," she says. "Further mass production of these kinds of polymers will have great potentials for thermal management applications." Pipe notes that improving heat conductivity in polymers is only one possible direction for this research. "It may also be interesting to block heat transfer by reducing interchain interactions," he says. "There are applications of polymers where blocking heat transfer is important."